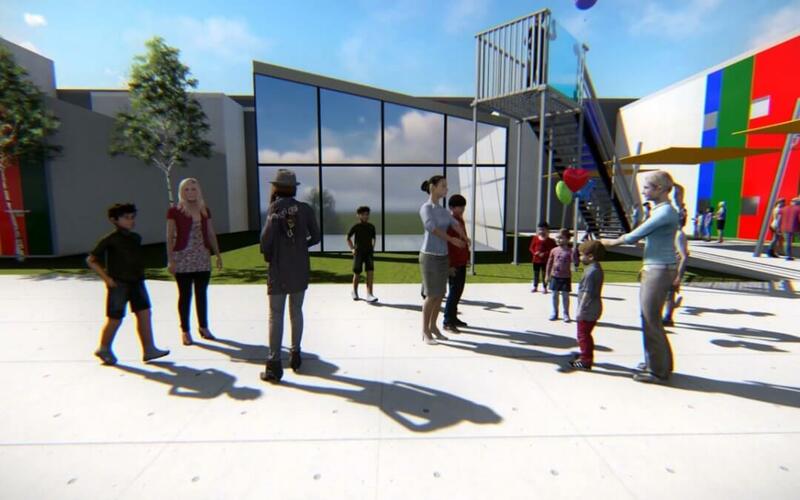 Ancon Construction Unveils Fly Thru Video of the New ETHOS Science Center! Ancon Construction and TMP Visual Concepts unveil the exterior fly thru for the new ETHOS Science Center. Since 2012 Ancon Construction has been working with ETHOS Science Center to plan and design their new home. Awarded as one of the Regional Cities projects, that dream is now a reality as construction has begun. Ancon architect Matt VanSoest has been the lead design driver on the project since 2012 commented, “Our goal was to provide enriching outdoor learning environments nestled into the landscape.” The outdoor learning environments include: botany study at retention pond, outdoor lab for science experiments, gravity drop test by re-purposing a former fire escape stair, central plaza with jumbo-tron to watch live feeds of events around the country pertaining to science and technology, grassy areas for outdoor learning/hands on science playground, solar panel study, and butterfly garden ecosystem. Check out the fly thru video below to see what the project will look like once complete. Do you have a dream? Ready to make it a reality? Contact Ancon Construction HERE to get your project started!